2016 Ethics Symposium concludes | Command and General Staff College Foundation, Inc. 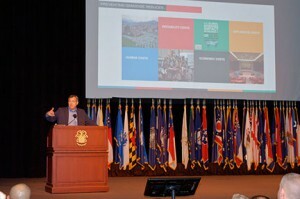 The 2016 Fort Leavenworth Ethics Symposium, cohosted by the U.S. Army Command and General Staff College and the CGSC Foundation, was conducted April 19-21, at the Lewis and Clark Center and the Frontier Conference Center on Fort Leavenworth. Foundation Chairman Lt. Gen. (Ret.) 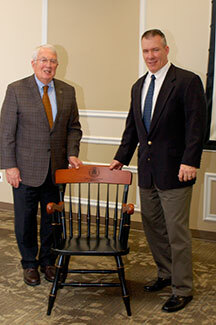 John Miller, left, presents Dr. Daniel M. Bell, Jr., the outgoing General Hugh Shelton Distinguished Visiting Professor of Ethics for CGSC, with a College chair in recognition of his service. Click the photo to visit the complete photo gallery. The theme of this year’s symposium “The Ethics of Humanitarian Military Operations and Intervention” was intended to explore the humanitarian, political, legal and military aspects of getting involved in humanitarian military operations and intervention. 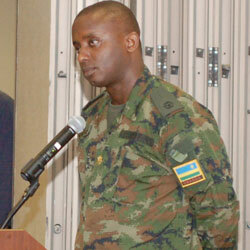 A highlight from this year’s symposium was a presentation by CGSC international officer student Maj. Ruki Karusisi from Rwanda, who spoke of his personal experiences in dealing with the genocide that occurred in his country in 1994. Other highlights included keynote remarks from Dr. Jim Waller, the Cohen Professor of Holocaust and Genocide Studies at Keene State College in New Hampshire. Joyce Hess, a Kansas City native and child of a Holocaust survivor, provided the closing remarks. Dr. Daniel M. Bell, Jr., the outgoing General Hugh Shelton Distinguished Visiting Professor of Ethics for CGSC, was honored at the closing luncheon. Symposium attendees were comprised largely of CGSC officer students from the ethics elective course. Eighteen papers were presented during the symposium. View all the photos from the three-day symposium. Visit the Ethics Symposium page for details on this year’s program and to download the papers presented. 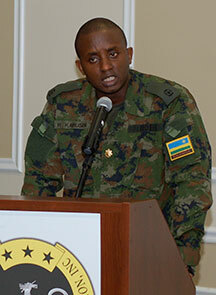 A highlight from this year’s symposium was a presentation by CGSC international officer student Maj. Ruki Karusisi from Rwanda. Click the photo to visit the complete photo gallery. Dr. Jim Waller, the Cohen Professor of Holocaust and Genocide Studies at Keene State College in New Hampshire, provides the keynote remarks at the opening of the 2016 Fort Leavenworth Ethics Symposium. – Click the photo for the full gallery.